MANILA, Philippines — A Philippine diplomat warned Tuesday that any Chinese move to turn a disputed shoal, where the U.S. Navy recently spotted a suspected Chinese survey ship, into an island will escalate the disputes in the South China Sea and asked Washington to convince Beijing not to take that "very provocative" step. Philippine Ambassador to Washington Jose Cuisia Jr. told a news conference in Manila that a senior U.S. Navy official reported spotting a suspected Chinese survey ship in the Scarborough Shoal a few weeks ago and expressed concern about its presence in the disputed offshore area. 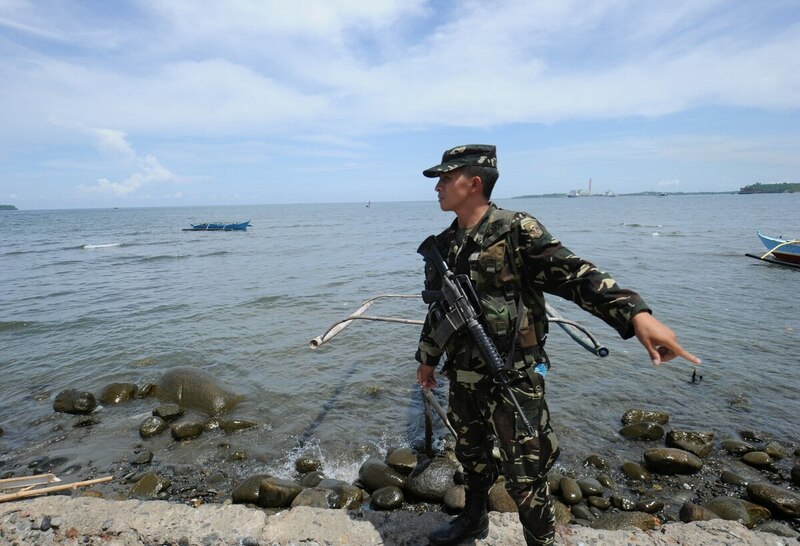 The Philippine military checked but found nothing, possibly because the Chinese ship later left the shoal, he said. China has said it has completed construction work to turn seven reefs into islands in the disputed Spratlys archipelago in the South China Sea, raising alarm in the region and sparking calls by Asian and Western governments for China to stop taking provocative actions that can lead to confrontations. Beijing says it owns the Spratlys, which it calls the Nansha Islands, and has a right to undertake construction there. The U.S. Navy sighting of the survey ship in Scarborough, a rich fishing area about 230 kilometers (145 miles) west of the Philippines, has reinforced suspicions that Beijing is eyeing the vast atoll as its next target in its island-making spree, Cuisia said. "That I think will be very provocative if they will build on Scarborough Shoal," Cuisia said, adding such an action "will further escalate the tensions and the conflict." The Philippines is incapable of stopping China from constructing an island in the shoal, where Filipino fishermen have been barred by Chinese coast guard ships, Cuisia said. "We hope that the U.S. and other countries ... would convince China not to proceed with that," he said. Washington does not take sides in the disputes involving China, the Philippines and four other governments but has declared that ensuring freedom of navigation and overflight in the busy waters is in its national interest. Cuisia said he was involved in a U.S. State Department-brokered deal for China and the Philippines to withdraw their ships simultaneously from Scarborough to avoid a potential clash during a tense standoff in 2012. China reneged on that deal by refusing to withdraw its ships after the Philippines did and now claims there was no such deal, he said. "We were shortchanged," Cuisia said.